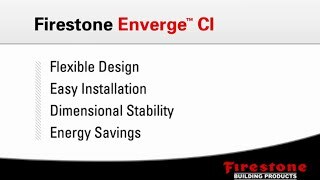 Firestone Enverge™ CI Glass and Enverge™ CI Foil Exterior Wall Insulation are fire-resistant, rigid insulation panels that consist of a specially formulated closed-cell polyisocyanurate foam core laminated to high performance facers. Enverge CI Glass and Foil provide outstanding thermal performance in commercial wall applications to provide continuous insulation (ci) within the building envelope. With the proper detailing, Enverge CI Foil can be part of the air, and water resistant barriers, as well as the vapor retarder in the exterior wall. Firestone foam technology incorporates an HCFC-free blowing agent that does not contribute to the depletion of the ozone. Fire-resistant core formulation offers FSI≤25 and SDI≤450. NFPA 285 fire-tested assemblies offer design flexibility. Contributes to the overall design solution for energy efficiency and potential for LEED® credits. Qualifies as an air barrier system component, which reduces heating and air conditioning costs. With the proper detailing, Enverge CI Foil can be part of the air- and water-resistant barriers, as well as the vapor retarder in the exterior wall. Product solutions available from 1″ to 4″ thicknesses, in ½” increments. Comprehensive Firestone Building Products code-compliant wall assembly construction details.